It’s a truism about certain people that they would have been ‘the greatest leader we never had’. I can’t think of any examples off the top of my head, but then I’d probably disagree with most of them anyway. It’s obvious to most people who don’t think that evolution is ‘the stupidest thing I ever heard’ that Al Gore would have been a preferable President to George W. Bush, but that’s partly because more people voted for him. In British terms, it’s clear to me that instead of that succession of toddlers, nobodies and ghouls who have fronted the Conservative Party in the last few years, Michael Portillo would make a much more charismatic and convincing leader, but for obvious reasons I’m not about to write to the Daily Mail and tell them so – besides which, something tells me that I wouldn’t get much of a hearing. I just hope that his sexual orientation causes him just as much pleasure and relief as it causes us. Zhao was a solid believer in the party, but he defined socialism much differently than party conservatives. Zhao called political reform “the biggest test facing socialism.” He believed economic progress was inextricably linked to democratisation. As early as 1986, Zhao became the first high-ranking Chinese leader to call for change, by offering a choice of election candidates from the village level all the way up to membership in the Central Committee. 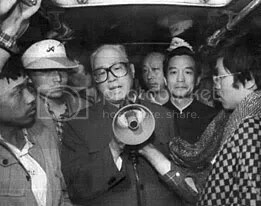 He was known in the west for two things, one of which was when in May 1989 he went down to Tiananmen Square to talk to the students, listen to their demands and try to persuade them to leave peacefully. During the subsequent crackdown he was at first sidetracked and then purged, disappearing suddenly and completely from public life. Think of it as kidnapping, if you like. The other major event was in February this year, when his death sparked panic in the Chinese authorities. They tried to control every aspect of his funeral and of every word of the coverage of his death in the media, and only just a few weeks ago arrested a Strait Times journalist who was trying to get his hands on a copy of his memoirs. A SECRET manuscript Beijing is desperately trying to stop from being published outlines purged leader Zhao Ziyang’s plea for China to abandon one-party rule and follow the path of democracy. It also airs Mr Zhao’s opinion the government blundered in its crackdown on the 1989 democracy protests that led to hundreds, if not thousands, of citizens being killed, the author says. The sensitive manuscript is now at the centre of the arrest of Hong Kong-based Singapore Straits Times reporter Ching Cheong. He was detained while trying to obtain a copy of the manuscript that has yet to make its way out of mainland China. China on Tuesday said Mr Ching was arrested for spying and had confessed. Its authorities have pressured author Zong Fengming, an old friend of Mr Zhao’s, not to publish the book. The 85-year-old, who compiled the manuscript from conversations he had with Mr Zhao while he was under house arrest, said what makes it so threatening to Beijing is the late Mr Zhao’s belief China must have democracy in order to prosper, and economic reforms are simply not enough. “He said China’s development must be on the path of democracy and rule of law. If not, China will be a corrupt society,” Mr Zong said. Reporting of Zhao’s death was limited to a terse few paragraphs in the state-controlled media as part of an official campaign to erase his memory. Mr Zong believes the government fears if a book about Mr Zhao’s views is published overseas and copies find their way to China, it could have a detrimental effect on the communist regime, making Mr Zhao a hero even in death. Mr Zhao’s views run contrary to the path China’s leaders are taking. The Chinese leadership is intent on maintaining one-party rule and quashing dissent or freedom of expression. It seems to me that if, following the death of Hu Yaobang, there was a candidate for China’s Gorbachev it was Zhao. Maybe if he had stepped into that hypothetical power vacuum in mid-1989, there would have been no crackdown, no unleashing of all the forces of political repression, no increase in political indoctrination for the young, no attempt to rehabilitate that monster Chairman Mao, and maybe the Chinese would have been allowed to freely use the internet to develop deeper and more open relationships with the rest of the world. Maybe China would have seen the flowering of a free press, and maybe there would have been some form of development of alternative political parties and perhaps even multi-party elections. Of course it is also possible that a China suddenly impatient for change would have pushed him aside in favour of an outsider, someone more radical and not connected with the Party machine. Obviously there is a possibility that the hardliners would have fought back and tried to regain power. It happened in 1991 with Gorbachev. But maybe, just like in 1991, the world would have seen this old guard for what they really were – old men whose time had passed, isolated and powerless, railing against a world that had left them behind.